A set of concept art images for an unnamed Sony game have been posted by their designer, suggesting that a Wild West themed game has been in the works. Ioan Dumitrescu is a freelance designer, and he took to the web to publish the work, which still features copyright logos from Sony Computer Entertainment. The art is attributed to an “undisclosed project,” but there’s been a fair amount of speculation as to what this might have been. The folks at VG247 have suggested it could even be a VR title, since Dumitrescu has previously worked on Sony’s VR luge game. This certainly looks feasible, too; the interior of the train carriage in the image above seems like it would be perfectly suited to an FPS VR experience. The other images feature some large scale set pieces, including the wreck of what appears to be a runaway train. 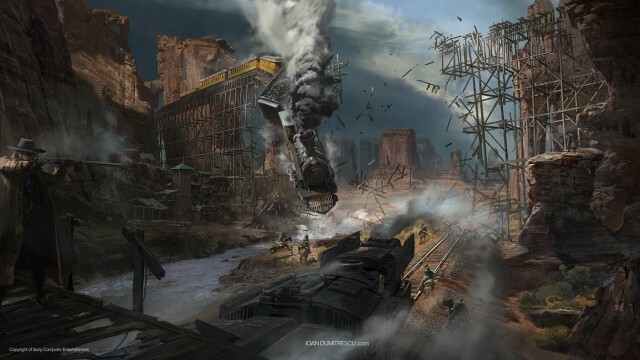 A shot of a railway-centric town also demonstrates a large number of gun-toters – most likely enemies – so it’s clear this concept is for an action heavy title. There’s no word at present on whether this is still a live project, but with Rockstar taking their sweet time with their next Red Dead game, a new Wild West title could be a big hit. We’ll be sure to bring you more news on this if Sony makes any comment.